Ibuki Hiiragi (Masaki Suda) works as an art teacher. He began teaching at his current high school two years ago. He is the homeroom teacher of 3rd Grade A Class. 10 days before graduation day, Ibuki Hiiragi stands in front of his 29 students, including Sakura Kayano (Mei Nagano), and tells them "From now on, you are hostages." Ir Mar 24 2019 9:32 am I watched this because I was bingeing all of Masaki Suda's new films and I saw that Mei Nagano was also in it!!! That's another famous actor slashed off her list (more to come lol). Suda never disappoints, he has again proved how amazing he is at acting! Now about the film, i love how it suddenly rushes my adrenaline just when I start to feel bored. Every episode has its own twist/surprise, you'll never really guess who did what because of how many people you'll blame lol and also, the main point of the whole barricade and hostage thing really made sense, it gave an impact to me as a viewer, Mr. Hiragi has done a good job lol. Liesianthes Mar 18 2019 8:11 am Just finished watching this drama. I really love how they tackle the plot twists and leaves you hanging every episode. I always thought that when they revealed this matter, my interest will be lowered, but no, they managed to hook you up again until they reveal something which is already there ever since, that we have just failed to notice. LET'S THINK! Never ever forget that if you will watch that drama. It caught me off guard a lot on the obvious things they dropped. Atika Mayangsari Mar 16 2019 8:18 am My favorite dorama. Thumbs up!! Kat Feb 24 2019 1:54 am Watched it for Ryota, I stayed for the great Story and lessons. Masaki Suda never disappoints me. Everyone is so good at acting. Also Ryotas acting skills have improved by so much❤️? nunginungi Jan 27 2019 4:35 pm Just finished watching 1-3 episodes, and can't wait for next episodes ?? n78 Jan 07 2019 9:50 pm omg, the first episode is so intense !! Sooyi Nov 17 2018 6:04 am This reminds me of the French movie "The Day of the Skirt" (lit.) where the teacher, stressed by the attitude of her students, the separation from her husband and the negativity around her wearing skirts, takes the opportunity to hold her class hostage when a gun falls from a student's bag. She uses this opportunity to finally teach her students in "peace" and to ask for a day where women can comfortably wear skirts. This movie was inspired by a real event in France. 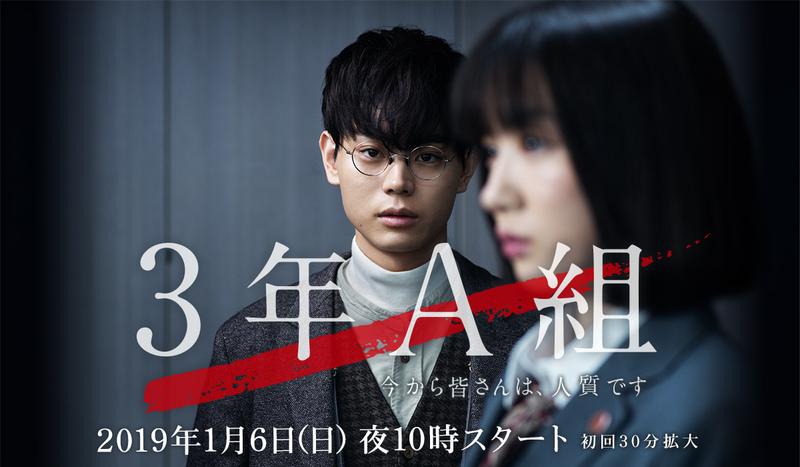 @Meann I don't think Masaki Suda is a bad guy here. Yeah he is considered "bad" because he takes hostage of his homeroom students, but I guess he has decided to do this because his job is probably so stressful, and nobody would listen to his pleas for reform. Rin-chan Nov 13 2018 6:20 am So Suda Masaki is going to play the bad guy here? Sounds interesting! Meann Nov 12 2018 11:14 pm Omedetou Gozaimasu Sudacchi for your first sensei role. I'm looking forward to it.The plot is interesting!